I'm not a fancy jewelry kind of girl. I have my engagement ring and wedding band, a pair of pearl earrings and... well, that's about it. The rest of my baubles are precious only to me. But about six years ago I saw a photo of a rough cut diamond ring in InStyle Magazine and have not stopped thinking about it since. I can't find the original photo that sparked this love (and if I do I'll be sure to post it), but the ring above is a close enough approximation to the "rough luxe" look I am drawn to. 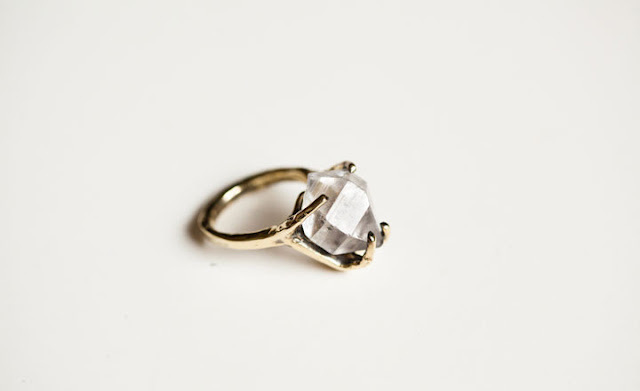 Designed in a limited edition by Gia Bahm of Unearthen for Of a Kind, the ring pictured is made from a Herkimer diamond -- not a real diamond, but a type of quartz found almost solely in Herkimer County, NY. (Note: I've read that some Wiccan and occult groups believe Herkimer diamonds have special powers, but I simply think they are pretty.) Sadly this limited edition ring is all sold out, but I find it inspirational to look at nonetheless. Don't get me wrong -- the allure of shiny, brilliant, polished diamonds is not lost on me. I love how sparkly my engagement ring looks when it's freshly cleaned, and I have gasped at celebrities' enormous gems like any other awestruck commoner. But whether it's a real diamond or a piece of quartz, there's something about these clear-white crystals in their natural state that speaks to me. Maybe it's that they're beautiful just the way they are. So, using some of the (very) small income I've made through advertising on this blog, I recently bought myself a little present: this pair of 18k gold dipped druzy stone earrings (on sale!) from jennleedesign on Etsy. I love the combination of the rich gold and the shiny, faceted crystals. 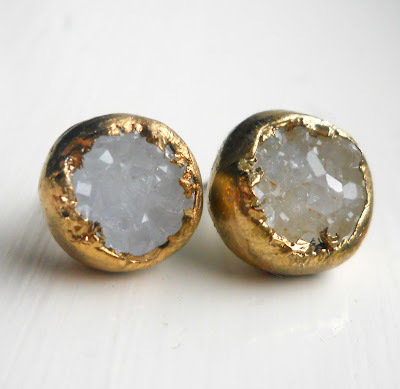 Druse is decidedly not any kind of diamond, but they make me feel fancy in my own way. And they were not expensive by many people's standards, but they were a little bit of a splurge for me considering the last pair of earrings I bought were $5 at New York & Company. I am not talented enough to photograph myself while wearing them, so you'll just have to wait in suspense until a real-life photo surfaces. In the meantime, I am having fun saying "The crystaaaals!" like Enik the Altrusian from one of our family's favorite ridiculous movies, Land of the Lost (the one with Will Ferrell). Anyone? If I called you "Mrs Gotrocks", would you understand the inference? Mrs. Gotrocks was the rich lady on the Flintstones cartoon. That video is awesome! I loved his genuinely excited reaction at the end. We live relatively near the Herkimer Diamond Mines and went there a couple of years ago. We found a handful of small "diamonds" and my husband had them made into earrings for me for our anniversary. I love them! Wow, that makes them even more special. I'm sure they are beautiful. Would love to see a photo! Apparently that's a popular destination -- who knew?? ?